Spoilers for the entirety of Shadow of the Colossus below. In description, Shadow of the Colossus is a game about about defeating 16 colossal bosses, contrasted with light exploration. This description alone might allow it to fall in the awfully loose genre of “action/adventure” if I wanted to be a little more specific, perhaps a “boss gauntlet”. These genres, in gaming, almost always delve into the realm of power fantasy, an approach to genre that emphasises wish fulfillment, the power of the protagonist to overcome all obstacles in their path and topped off with a joyous ending in which the protagonist is rewarded for their actions. Shadow of the Colossus is none of those things. It is something far more interesting, something not often approached in gaming, and far less often done well. Shadow of the Colossus is a tragedy. Right from the start, our stakes are set. The protagonist, Wander, wishes to save the girl, Mono, from death. Her relationship to the protagonist remains unknown, all that is known about her is that she was sacrificed “for she had a cursed fate.” Like all of Fumito Ueda’s games, the world building is incidental. It’s what we don’t know, what can only be implied by the little information we have, that makes the setting so interesting. To achieve Wader’s wish he travels to a land “to trespass upon… …is strictly forbidden” then laying Mono’s body on an altar he makes contact with a being known as Dormin. At this point Dormin appears as a collection of shadows and then a collection of voices. The shadows, more analogous to demons, the voice, appearing from a beam of light, appears to be analogous to a god. “I was told that in this place at the ends of the world- there exists a being who can control the souls of the dead.” Wander claims, and Dormin confirms. A being like this could not give something for nothing, but the quest is made clear, defeat the 16 colossi contained in this land and Dormin will restore Mono’s soul. From that point, in the first cutscene, before the player ever takes control, Wander has made his fatal error. Only then is the player given control. Shadow of the Colossus, in its setting, is an open world. You’re free to explore anywhere within The Forbidden Land. In every other sense Shadow of the Colossus is wholly linear. You cannot leave, you cannot turn around and give up. You must defeat all the colossi in a set order, you must fulfill Wander’s cursed fate. This puts Shadow of the Colossus in a position not too dissimilar from many other games of ludically open, narratively linear. I often find myself critical of games with overly linear stories, when the characters could have made different choices, but they player could not, because any opportunity to take a different path is met with a cutscene to take control away. Let’s use The Last of Us as an example of a popular game with a cutscene driven story. By the end of the game Joel wakes in the Firefly’s hospital, looking back on how they got this far he says “Maybe it was meant to be.” but was it? At any point Joel or Ellie could have taken different decisions that would not have lead them to the Fireflies, but this decision was not the player’s, the decision is entirely out of the player’s realm of control. In Shadow of the Colossus, the player similarly lacks a control over the fate of the protagonist. The crucial difference is that Wander no longer has control of his own fate, either. When he enters the Forbidden Lands the only exit seals behind him. The only choice that may even exist is to finish his quest or perish, the only choice for the player is to complete the game or give up. A lack of choice here is narratively consistent in Shadow of the Colossus, while it may be narratively dissonant in other games. Wander is the tragic hero, his fate is sealed. Enforced in every moment of the game is Wander’s normality. In battle with the collossi he can often appear to struggle. It’s testament to the expressiveness of the animation of Shadow of the Colossus in reinforcing just how small Wander is. When climbing a colossus, he will tremble as it shakes and moves. Wander will flail, desperately gripping on, as the colossus tries to shake him off. He runs with a certain limpness, when he jumps his arms flail about wildly, he swings his weapon loosely as if he has had no training with it. Wander is not suitable to be a hero, but he tries to be one regardless. Director, Fumito Ueda’s study was in animation and his expertise shows in all his games. The soundtrack perfectly reflects the arc of every colossus battle from Wander’s perspective. From afar it is curious, with an anxious undertone. You don’t know what this beast can do to you, but it is far bigger than you. As Wander scales his foe and he gets closer to victory, the music becomes more epic, more triumphant, that is, until the final blow is landed. The music stops immediately, the creature, that before was only seen from below or never fully in frame to emphasise it’s size, is now seen from a more neutral angle. The music melancholic as the colossus falls to it’s death. Instead of triumph in success, any triumph that existed in getting closer to your goal is wiped, for a sense of loss and a moment of reflection to see the slain beast before the black tendrils come to possess Wander. 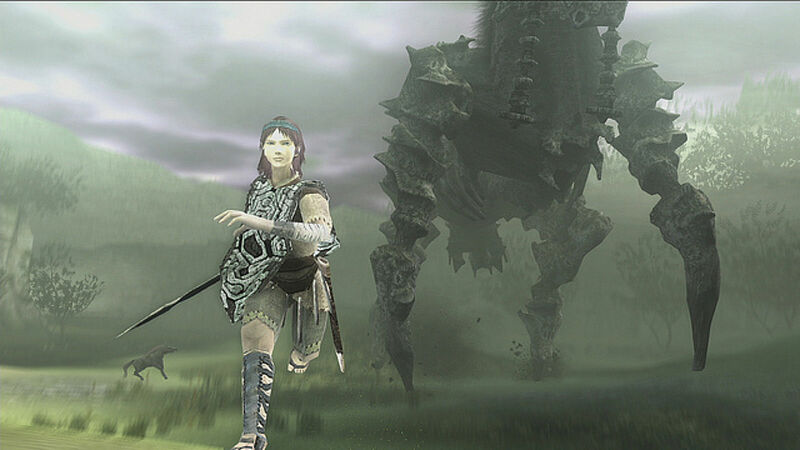 Each of the colossi vary in size and personality. Each have their own quirks, some are more aggressive, others hardly aggressive at all. Regardless, they all fall. When Wander awakens in The Shrine of Worship after slaying a colossus, a new shadow appears around him, just as a new dove appears besides Mono’s body. Wander’s quest is not easy but the symbolism is clear: it is not virtuous, either. By the end of the game, after overcoming an immense amount of challenge, Wander is weakened and exhausted. His clothes more ragged and his appearance cursed and corrupted. After the defeat of the final colossus Lord Emon, who is implied to be an important figure in Wander’s society and possibly involved in Mono’s death enters the Shrine of Worship with a group of armed men, but it is too late, Wander has fulfilled his duty and done as Dormin requested. When Wander, demon-like and limping appears, he is stabbed, a black corruption sprays from his body like it once did from the colossi he pierced, before he is fully consumed by Dormin, now revived and in physical form. Was this Mono’s “cursed fate”? To bring the revival of Dormin? If so her sacrifice was the inciting incident in his process. As is the nature of prophesy, attempts to avoid it only bring it closer. The game, in a role reversal, now allows you to play as the colossal Dormin as you attempt to crush the humans below you, but it is no use. They escape and in a last-ditch attempt to seal Dormin back away, a sword is dropped into the basin from the beginning of the game and a vortex appears. Dormin begins to dissipate and is sucked away leaving only Wander. In what is probably one of the greatest pieces of storytelling through gameplay I have ever experienced, you are given control as Wander is sucked in. Being pulled further from Mono’s altar and closer to your end. You can jump and run, you can struggle as much as you possibly can, but it is no use, you will always be pulled into the basin. You have control of the minutia, you do not have control of fate. A idea the reflects the whole of Shadow of the Colossus.